These are the tour books for the Rainbow tours in 1975-1976. The Long Live Rock 'N' Roll tour books are sometimes called On Stage tour books. 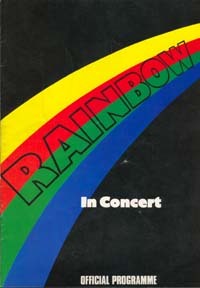 This tour book has a yellow-red-green-blue rainbow on black front cover, with Rainbow written over the rainbow & texts "In Concert" and OFFICIAL PROGRAMME in white. One page is dedicated to the support band Stretch. 20 pages, 21cm*29.5cm. Very rare tour book. The picture has a ticket attached on the tour book cover. Front cover has the hand rising from the water, holding a rainbow. 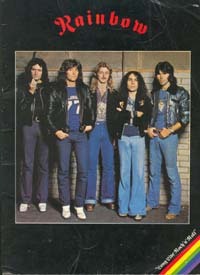 Several pictures of the band on the cover as well. 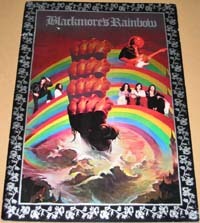 Silver ornament around the cover and silver text "Blackmore's Rainbow" on the top. 36 pages, 25.5cm*36cm. 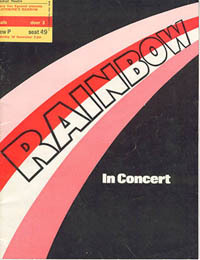 The front cover has a big picture of the band with red Rainbow logo on the top. The lower right corner has rainbow stripes with white text "Long Live Rock'n'Roll". Two pages of the book are for Kingfish, the support band for the tour. Apparently quite rare. 20 pages, 22cm*30cm. 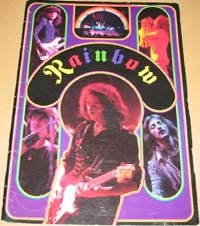 The front cover has a big picture of the band with red Rainbow logo on the top. The lower right corner has rainbow stripes with white text "Long Live Rock'n'Roll". Two pages of the book are for Kingfish, the support band for the tour. This tour book is essentially the same as the other UK tourbook, except a couple of photos are different. According to some sources, Ritchie Blackmore didn't like the original photos and had them changed mid-tour. 20 pages, 22cm*30cm. The front cover has a big multicolored Rainbow logo in the middle, as well as pictures of all the band members. 40 pages, 25.5cm*36.5cm.